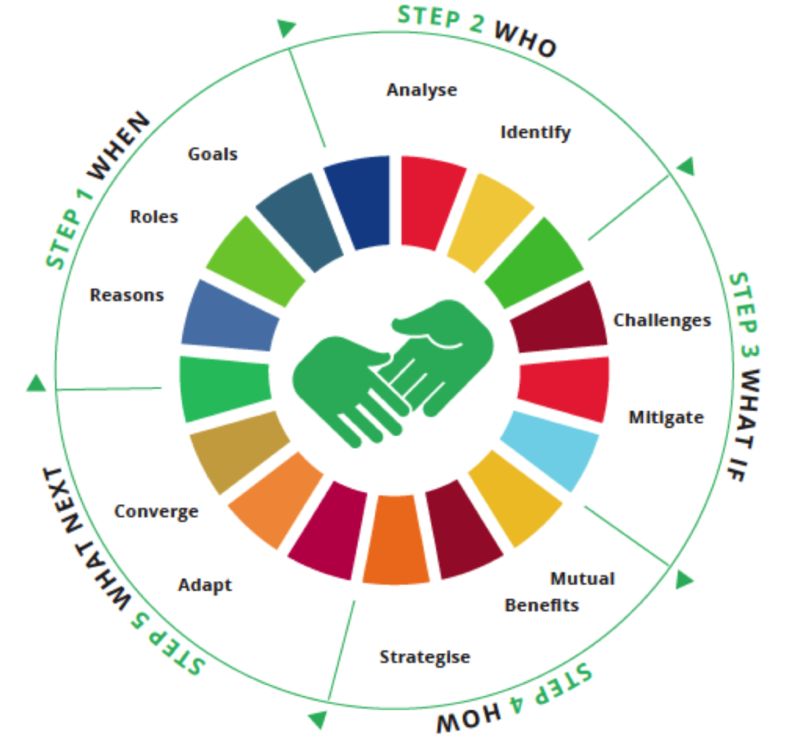 PPPLab’s Marije Balt (PRC) launches PPPLab’s ‘Partnering with Governments for SDGs’ tool, and reflects on how PPP experts see the added value of the tool. If there is one thing that partnerships regard as cumbersome, it is working with (local) governments in developing countries. It takes time and effort while success is not guaranteed. However if the ambition is to address the challenges reflected in the Sustainable Development Goals (SDGs), we need more inclusive partnerships. This is why the PPPLab tool developed a new tool for partnering effectively with governments. It takes partnerships through 5 steps: (1) when to partner, (2) with whom, (3) what to do if challenges occur, (4) how to promote mutuality and commitment and (5) what to do next to maintain momentum. 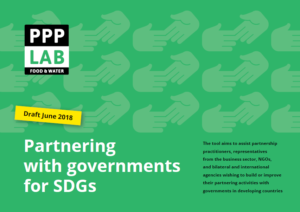 The Partnering with Governments (PWG) for SDGs tool was developed by PPPLab to better analyse, get inspired and reflect on how to partner effectively with governments. There is much to learn from other partnerships that have managed to do so, as published in earlier research. Their key to success was understanding government partners’ interests and benefits, and acting on this. The PWG for SDGs tool aims to assist partnership practitioners, private sector, NGOs and bilateral and international (donor) agencies in building their partnering activities with governments in developing countries. This version of the tool is a draft which will be edited and adapted based on feedback and comments in the next months (please see below). Over the last months, several test sessions have been helped to focus the tool better on the specific needs of partnerships. The product of these sessions is a step-by-step approach consisting of 11 guiding questions, partnership practices and tips and tricks. Step 1: when? This set of questions helps to determine the timing and phasing of partnering with government. Its focus is on identifying reasons to engage government, roles and contributions by government and the extent to which the partnership aligned with its goals, policies, laws and regulations. Step 2: who? thus presents several guiding questions and tools on whom to work with in case new partners (want/need to) come on board. This step gives users insights into level(s) of engagement which is helpful to identify partners with whom to work. It provides a set of questions, resources and tools on mapping stakeholders. Further questions zoom in on the track record of potential partners. Step 3: what if? therefore focuses on common challenges of partnering with government, such as weak accountability and integrity, lack of continuity, and limited capacity. The guiding questions are presented in combination with a number of tips and tricks to cope with these challenges and risks. This is what steps 4 and 5 focus on, demonstrating how other partnerships have managed to cope with challenges and converge interests with government with a view to getting them fully on board. Step 4: how? This step’s guiding questions help understand the motivations and interests of the government, and build commitment with government to work together in partnership. These include: help with policy design and implementation, the provision of certain government services, strengthening the political mandate and capacity building. In the section featuring previous PPP practices, the tool demonstrates how other partnerships have been responding to these interests, motivations and benefits in an innovative, creative way. Step 5: what next? Adapting the partnership to include and adjust the (governance) arrangements accordingly is the last step. These guiding questions also allow for further convergence of interests with government. In case circumstances or partners change, the tool allows for repeating the step-by-step process at any point. Although the tool does not focus on how to design PPPs, it does make reference to the relevance for and links to the SDGs and Agenda 2030 at the end of each step. As in our animation, the tool regards the Sustainable Development Goals as an important basis for collaboration. PPPLab would like to invite you to provide more feedback on this draft version of the tool. Please send your comments and questions by email: info@ppplab.org mentioning in subject line ‘PWG for SDGs tool’, no later than 1 September 2018.